We no longer offer this product, we have something even better to meet your needs. Find it here. This powerful straightening balm with argan oil from Morocco makes it easier to blow dry your hair, while creating a weightless, humidity-resistant barrier to frizz for lasting smoothness and shine for up to 3 days. Squeeze a small amount of balm into hand. Rub hands together, work through damp hair and blow dry. 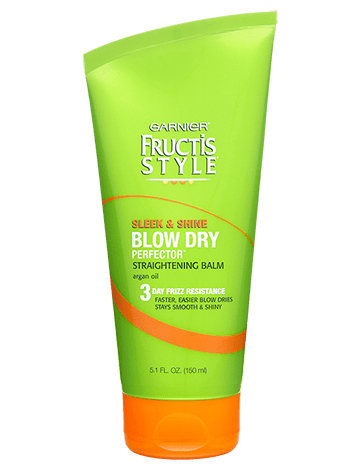 For best results, use the Garnier Fructis Sleek & Shine System of shampoos and conditioners. 1031235 A: Aqua/Water, Amodimethicone, Cetearyl Alcohol, Trideceth-5, Polyquaternium-37, Phenoxyethanol, Propylene Glycol, Dicaprylate/Dicaprate, Steareth-20, Glycerin, Parfum/Fragrance, Phenyl Trimethicone, Cetyl Hydroxyethylcellulose, Trideceth-10, PPG-1, Trideceth-6, Xylose, Oryza Sativa Bran Oil/Rice Bran Oil, Limonene, Chlorhexidine Digluconate, Linalool, Sodium Nitrate, Butylphenyl Methylpropional, Hexyl Cinnamal, Citronellol, Argania Spinosa Oil/Argania Spinosa Kernel Oil, Silica, Benzyl Alcohol, Polysorbate 60, Citral, Sodium Acetate, Sodium Hydroxide, Citric Acid. F.I.L. D47260/2. Rated 5 out of 5 by Tamara B from Please make this again!!! This is he ONLY product that works on my hair, keeping it manageable and smooth without being sticky. Please bring it back! Rated 5 out of 5 by Memfusgal from PLEASE BRING THIS PRODUCT BACK The product you are replacing it with is not the same thing. It's a spray on mist and is for flat ironing. This cream was the only product that worked making my hair straight with blow drying. The thick cream was perfect. I don't understand why you took it off the market. Rated 5 out of 5 by Mreese from Bring it back! I love this product please bring it back and exactly the same as it was! Please! Rated 5 out of 5 by Shabbycabaggerose from The absolute best I have wavy frizzy long semi thick Grey color treated hair. This is the only blow out cream that has ever worked for me your hair will shiny smooth straight and silky for 3 days or more . Better then any professional product I've ever used and I'm a licensed hair stylist and have used many. Rated 5 out of 5 by ina1959 from Excellent This is the only thing that works for when I'm blow drying my hair. I have thick hair that is difficult for me to style as there are some natural curls that can stick out at odd places. Applying this cream prior to blow drying cuts down drying time to half and my hair is magically straightened without much effort. Garnier, pls bring this product to Singapore as I can only get it when I visit the States. Was in the US recently but could not find it in Target. Why? Rated 5 out of 5 by Jonsey from Great in a humid climate Great product, works on my curly hair. Having a hard time finding it in the stores. PLEASE BRING IT BACK. It is the only one that works on my hair. Rated 5 out of 5 by JMey from Please don't discontinued This is the only product that works on my sons curly hair. Please keep selling it in our market. Rated 5 out of 5 by MaryMe from Why can I not buy this anymore/ I love this product. It is perfect for my hair. Why are you not selling it anymore in stores. I have to order via Amazon. This is frustrating. Please mass distribute this product again.